My name’s Peter Bartholow, and I’m… a bunch of things here at Reverge. While my official title is “Lead Designer,” I’m also spearheading a lot of community and PR work, as well as helping out with some internal production stuff. 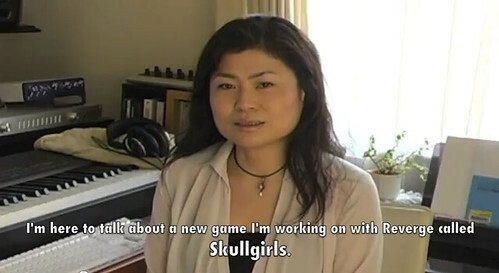 As you may have heard, last week we announced that Michiru Yamane, famed composer of Castlevania: Symphony of the Night, is composing Skullgirls’ soundtrack. Based on the internet reaction, it’s clear everyone’s as happy about this as we are. “How did this little indie studio land such a big name?” the internet wondered collectively. The short answer? We actually tried. Seriously. Be it due to a presumption of impossibility or musical snobbery, I don’t think it ever really occurs to most western developers to even try to contract Japanese composers. But, knowing her sound would be a great fit for the game, we set our expectations low and ventured into the unknown. It all began in late 2009, when Richard, Emil and I were pitching our other game, “Project OT,” to various publishers. At a meeting with Ignition, Shane “Mangod” Bettenhausen mentioned that Yamane-san was available. I didn’t think her musical style would be a good fit for Project OT and we’d already initiated contact with another Japanese composer for it, but I thought her music would be perfect for Skullgirls. When Autumn signed Skullgirls months later, I suggested we pursue Yamane, and we contacted our friends at localization company 8-4 to see if they could make it happen. I’ve been friends with 8-4’s principles since my days in the gaming press, and they have especially excellent access to Japanese game composers, many of which have left the companies that made them famous to become independent. They contacted Yamane, and we were off. Setting up the initial terms of the contract was perhaps the most difficult part of this process, because of the different ways Japanese composers work. I don’t want to dwell too much on another “East vs. West” discussion, but feel this is worth mentioning. Western composers typically come on towards the end of a project, produce a contractually-defined X minutes of music for your game, and then they’re done. Japanese composers, on the other hand, come in earlier in the project and… just kind of work until they feel they’re done: the client specifies what kind of sound they’re looking for, and then the composer produces as much music as they feel is appropriate. Because Skullgirls is a fighting game with a handful of stages, she was able to tell us concretely how many songs she would do early on, so in the end, this actually ended up pretty straightforward for us. To get Yamane-san started, we presented her with concept art of the stages and some story background, and less than one month later we got our first track, the one that would define the rest of the soundtrack. We were really pleased with this track and approved it immediately, knowing that we’d made the right call. WIth the tone set, we received about two tracks every month after that. When we’d have feedback or request changes, 8-4 would translate them and pass them back, and we’d have updated tracks waiting for us a few weeks later. All in all, it’s gone really smoothly and was far easier than we had ever expected. I’m honestly a little surprised that nobody even guessed that she was involved, because the music you’ve heard in gameplay videos definitely fits her style. But clearly a Japanese composer working with a U.S. studio was a bit of a leap, and, now that I think about it, I’m fairly certain we’re the first western developer to hire a Japanese composer… ever? So that’s how we signed the legendary Michiru Yamane! Everything’s gone so well, we won’t hesitate to sign her or another Japanese composer again. In fact… bet on it!